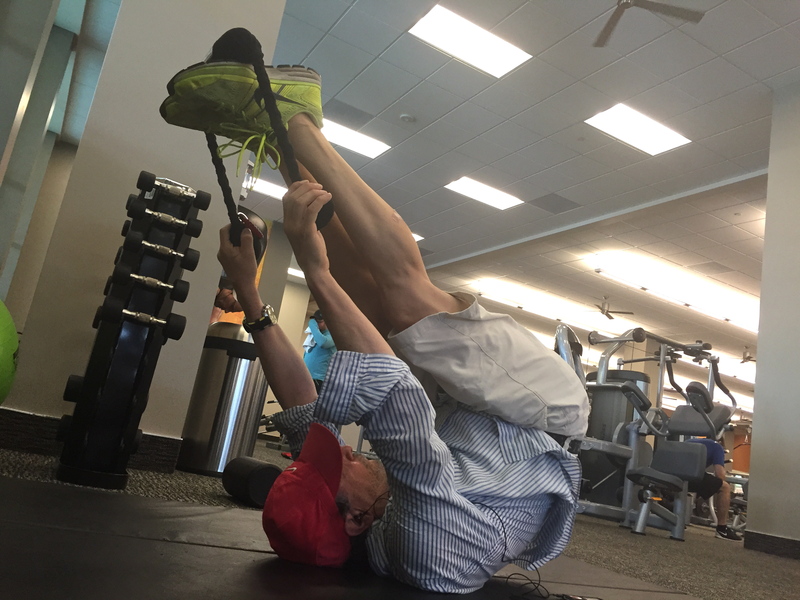 The RollerSizeR® Ab Tool, is so in Fashion! What does a “Fit” person look like? They usually are wearing exercise clothes, carrying a rollerd up yoga mat under their buff arm, a fancy water bottle and sporting a walk that has a serious attitude. Did I get it right? Maybe I missed the coffee they are holding in that “third” hand and those super bright high tech feet wear! There Got it! Well, move over “Fashion Fitness Freaks” there is a new look in town, especially here in West Seattle, WA! I came from NYC late 2013 to take care of my Dad in West Seattle till his passing mid 2014. To keep my mind off all the sadness, I starting this blog thinking I would be able to post daily. Wrong. But after getting my RollerSizeR game on, I started teaching a specialty fitness classes with my best fit friend, The RollerSizeR. The class is called The Waist Away Workout™ and I teach it at Fitness Revolution with Jill in the West Seattle Junction, at the West Seattle Track and sometimes at my Dad’s house. I was not to sure how it would go over as the concept is so new and The RollerSizeR is not known on the fitness scene, YET! Also, the poor RollerSizeR has it’s draw backs. It looks like a dog toy! But, I have actually gotten a few clients cause it looks like a dog toy! That being said, how do you sell a fitness class that uses a “Dog Toy” looking device? How do I send the message that this “Dog Toy”can take a serious bite out of the belly? Not Easy! When first timers come into take my Waist Away class they give me a weird look. They look at me first and think, she is going to teach Ab fitness classs? First I do not look like a typical trainer. I also do not sport fitness shoes. I wear shoes with a bit of a heel, skirt or skort and always a baseball cap to control my fly away hair. They probably think I am not a very good trainer. I throw the new victim my “Dog Toy” (The RollerSizeR), they look at it, look at me, and I see it in their eyes, where is the exit sign. The regulars, the recruited, the believers are in class with their RollerSizeRs placed perfectly under their waistlines. They are waiting for the “Crunching Commands” from the leader of the pack, the six pack, The RollerSizer Certified Instructor, ME. The new comers are worried. What they do not know is The RollerSizeR is going to take a bite, big ones, tiny ones all around the meat of their middle. They are going to get “Waisted”. I continue to go from one exercise to the next chewing, devouring and eating up their waistlines. We are now into the class five minutes and clothes are coming off. It is a sweaty fit fest and bellies are burning and the weapon of waist destruction, The RollerSizeR has a grip of their guts. The class ends. They join. But how do I get more! The only way to get to these Seattle folks is to get them into just one class. They just need one bite. I just need to tie them up in a RollerSizeR pretzel stretch and I will have them like Cujo, trapped in my RollerSizeR clutch. Fitness is like a fad here, well actually anywhere, NYC is probably the proven place where new fitness programs get a launch. Strollercize started in NYC and The RollerSizeR was tested in Strollercize and the Moms loved it. But here in Seattle, the folks are a bit different. I have to be careful cause I am one of them. The people here are more reserved, more to themselves, a bit cold. They call it the I “Seattle Freeze”. Yep, if you are not in their click, you are not in the groove. One has to really break into the scene. Everyone is in their own world and has their own friends and most likely their own fitness workouts in place. How do I make The RollerSizeR fashionably “Fit? A Must Have, Super Chic & Cool, the Wow “Thingy”. How? It will mean making a statement, making it “In Fashion”, a “Must Have”. This is the town that fashions itself on innovation, great ideas, lots of firsts here too; Starbucks, Cosco, Zuilly, Boeing, Microsoft, and yes, The RollerSizeR wants to join the group! I do have Tool! My fiance! Pictured below is a Connecticut lad that moved to Seattle for me, since I was not moving back to the east coast. He dresses in pink, blue stripes and always has a sweater over his shoulders! But, not today! He has gone “Classic Fit Fashion”! He is the model of fashion and fitness! He has the look and look at those shoes! My plan, send him out dressed to kill and hope people will say, “I love your out “Fit”! He will say “Thank You” and do you love my handles! My fiance comes to most of my Waist Away Classes and he has found his 32in waistline! Move over Yoga mats, Pilates Wheels, Medicine Balls, Ab Rollers and Kettle Bells , The RollerSizer draped over the shoulders is ready to melt your “Berg” around your belly and get your Waisted and high on fitness! FashON! Just throw it over your shoulders like a “Sweat”er! Categories: Ab Workout, Belly Fat, Core Training, Extreme & Hard, Fat Loss, Flat Abs, over weight | Tags: ab workout, elizabeth trindade, exercise, lose weight, New Moms, portable ab tool, rollersizer, strollercize, the rollersizer, waist away workout, West Seattle | Permalink. Day #2 of The 365 Days of Fit with It, The RollerSizeR®! The Ab Truth is this, I really do NOT like doing crunches! But I do like that burn in my belly when I get the connection. This particular exercise with The RollerSizer, I like as I feel the work FAST. I also like it because I do not have to get down on the ground to do it. But, in the sample video shot, I am on the ground. I sort of like fitness to be Super Accessible, convenient! Fitness that is easy to do, that gets results fast and feel you feel the magic! There are so many Convenient Stores, Snack Machines, Soda Machines, Quick Stop Vendors, Drive Up Windows and well, you get where I am going? That being said, this exercise of Day #2 of The 365 Days of Fitness, will FIT your needs. The http://www.therollersizer.com is waiting for you to make it easy and to make you FIT with IT! Categories: Core Training | Tags: abdominals, core training, elizabeth trindade, Fitness, lose weight, New Moms, Personal trainer, strollercize, the rollersizer, weightloss | Permalink.